One of the things that every almost every country (besides the USA) has in common is its love of football (soccer) and almost rabid backing of the local teams. Serbia is no exception, and your loyalty to one of the 2 premier teams defines people to a great extent. I've had the opportunity to attend a number of games involving both teams, as well as a cross-town meeting that was unbelieveable. Both teams set up their fans with placards or garbage bags of different colors to make a pattern at the start of a game (or halftime). Here is the Red Star - complete with flare burning - at the start of the Red Star/Partizan game. 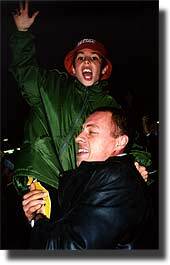 A dad and son at their first game (he bought the hat for his kid there) celebrate one of Red Star's 3 goals.